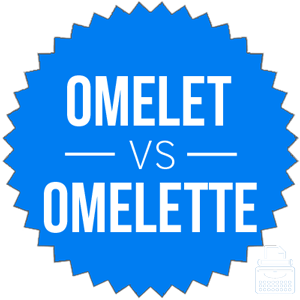 Home » Omelet vs. Omelette – Which Spelling is Correct? Most restaurants that serve brunch offer omelets as an option. This delicious breakfast treat has been a favorite of brunch-goers since before brunch was a familiar concept. If you brunch often enough, you may notice that some menus spell the word omelet, while others use omelette. Will the dish be the same no matter how it is spelled? Should you order it anyway? These decisions are not to be made lightly. Luckily, the biggest difference between these two words is their spelling. Whether you order an omelet or omelette, you will be eating the same thing. Here’s why. What is the Difference Between Omelet and Omelette? In this post, I will compare omelet vs. omelette. I will outline when it is correct to use each spelling and offer example sentences that demonstrate the proper context. Plus, I will show you a helpful memory tool that allows you to choose omelet or omelette correctly for your own writing, any time you need one of these words. What is an omelet? Omelet is a noun. An omelet is a breakfast dish made of eggs. To make an omelet, beat a few eggs in a bowl, then pour them into a hot pan. When the bottom of the eggs begin to set, add vegetables, meat, cheese, or any other ingredients you want over half of the mixture, then flip the other half over it to enclose the fillings. Omelets are very popular because they are delicious. You will be sure to impress any guests you have if you cook some for them. When Sierra and Tom went out for brunch, they both ordered country omelets. Jasmine always woke up early on Saturdays to make pancakes for her children and an omelet for her husband. Like the dish itself, the word omelet is French in origin. What does omelette mean? Omelette is the French spelling of the word. It is also the preferred spelling in British English, while omelet is the usual American spelling. These charts show the relative usage of omelette vs. omelet in American and British English, respectively. As you can see, Americans use the spelling omelet, and the British continue to maintain the French spelling omelette. These words are equivalent in usage and meaning. Omelet is more common overall, especially in American English. Omelette is the preferred spelling where British English holds sway. Since omelette is the French spelling and England is closer to France than America, you should have little trouble remembering to use omelette with British audiences. Also, omelette contains an extra “E” at the end of the word. Think of this “E” as standing for England. Is it omelette or omelet? Omelet and omelette are two ways to spell a noun that refers to a delicious breakfast entrée. Americans spell the word omelet. Britons spell the word omelette. Other than that distinction, the words are equivalent and can be substituted for each other at will. 1 What is the Difference Between Omelet and Omelette? Miniscule or Minuscule – Which Spelling is Correct?